Over the course of my time here, there seem to be a handful of posts that I keep referring to. These posts are referred to because of other studies that arise, or questions that come up. I don’t consider my blog to, for the most part, have provided a plethora of new information to the discussion on climate, climate change, or the science behind the data. Most of my posts on the subject are more of a curiosity. “Hey, here’s a bunch of data. Here’s a bunch of trends at different lengths. Here’s how those trends are changing.” Most people with an understanding of Excel and statistics could do something similar. I guess maybe others aren’t as interested to just look through a bunch of numbers to see if any interesting things jump out, so to the extent I’ve been able to add something, that’s great. There have been times, though, where I do an analysis and put together a post that I’m particularly proud of. I believe it actually does add to the debate. Interestingly, those more complex posts with an actual interesting conclusion seem to get less attention than a simple trend line chart. I continue to be astonished by the debates that can ensue over a simple line chart. But nevertheless, since there are a few posts that (a) I really like, (b) refer to quite a bit – and every time I do I have to dig through and remember where it is, and (c) I think actually add a new insight to the debate, I thought I’d highlight these posts again, while putting them all into one post. Received an interesting e-mail from the brokerage where I place my trades on 6/15. Making it clear that they offer no trading advice, they nevertheless gave the heads up on the Greek Parliamentary vote on the following Sunday. It was just a statement of potential volatility in the market to come, so it was a reminder for people to assess exposure so they can make sure they have stop losses in tow, close any overexposed positions, etc. I can’t remember getting that kind of heads-up e-mail before. I’m a fan of volatility. Even with short-term losses, I usually pick up extra positions that bounce the other way before too long and I find volatility to be good profit opportunities, so I made no changes to my trading strategy. As it turns out, the result of the elections was such that the excessive volatility never materialized. In fact, June was an overall quiet month. I am an actuary in the insurance industry, and so receive information of all sorts that are supposed to enlighten me and assist me in my job. Whether it is a better model to use in forecasting future experience based on current trends for the purpose of pricing products, or accurate assessment of ultimate losses on current inforce products, it is imperative that I understand new advancements in predictive modeling, underlying trends, and results of different studies to most benefit my company and the customers we serve. In this capacity, I recently came across a 97 page effort by Allianz, in partnership with – get this – the WWF (World Wide Fund for Nature), entitled “Major Tipping Points in the Earth’s Climate System and Consequences of the Insurance Sector.” As someone who wants to base pricing considerations on observed experience and modeled trends, I was curious about this paper, and how it is implied that this is to be used by the insurance industry. The report isn’t a new one, but it was the first I had run across it. Page one teaches us some interesting details. I learned that there is no global agreement or scientific consensus for delineating ‘dangerous’ from ‘acceptable’ climate change, but 2 degrees Celsius seems like a good number. The origin of that 2 degree number is not clear, but seems to be promoted based on the UNFCCC Assessment Report (AR4). We then learn about tipping points. The theory here is that, while temperature may increase gradually, there are points where a small change can make a big difference in the system. The cited reference here is M. Gladwell, “The Tipping Point: How Little Things Can Make a Big Difference.” It is unclear to me if this is a how-to book on marriage, or something spelling out the global catastrophes to come, but apparently it’s good enough for the reinsurance industry. There is then a touching “Take Home Message” to conclude the Executive Summary. We learn that past emissions have already committed us to at least 0.6 degrees of further warming. Because we’re lazy and lackluster in our efforts to combat it, the 2-3 degrees scenario is almost certain to happen. I must say, as I read the actual body of the document, I was pretty disappointed with my reinsurance brothers and sisters. We start with simply references to other works, clearly fed to them by WWF and other environmentalist groups. UN studies, IPCC papers, etc. tell us there will not be a smooth transition into warmer temperatures. This leads into the definitions and characteristics of tipping points, which – let’s be honest – insurance people will not know whether the studies they are reading are right or wrong. They’re insurance people. But in any case, it doesn’t appear that there was a serious attempt to reach out to alternative opinons on the matter. Nobody called me, which can be expected. More importantly, I don’t think Dr. Roy Spencer got a call either. I don’t even think Jeff from the Air Vent was consulted. A travesty. Section 2 focuses on identifying tipping elements based on IPCC AR4. On a serious note, from a reinsurance standpoint, the things they are looking at need to be considered for the purpose of understanding exposure to risk. What kind of storm activity tends to occur with changes in the ENSO amplitude? What is the exposure in the event of differences in monsoon activity around the globe? What are the insurance impacts to glaciers melting? What are the impacts of this event or that event? All legitimate questions to make sure the company can sustain viability should certain things occur that impact loss payouts. The issue I have here is putting such study in a document that doesn’t just use global warming theory as a “what if” scenario, but presents it as a given. We then get into all sorts of scenarios around different tipping points. It’s all the same stuff: Greenland, Arctic Ice, sea level rises, the Antarctic, carbon stores in permafrost (amplified global warming, you know), and so on. Then, we get into tipping points that can tip other points, or something like that. Section 3 highlights the greatest risks to our dismal future. So, what am I most disappointed in? My disappointment is mainly that this is a piece of propaganda disguised as an insurance study. If it is an insurance study, it’s a horrible one, and I’d fire anyone who resented it to me as a definitive assessment. I see no industry experience and actual trends presented. It is a “study” in the sense that it covers a lot of “what if” scenarios, which is an entirely legitimate exercise, but it provides them as a near certainty as opposed to a random probabilistic event. Oh, sure, there are a lot of graphs and charts that lead one to believe that this is a rigorous study, but it is not. It is a study that has, at its basis, a complete trust in the views and conclusions of a few UN-sponsored reports and other data that is derived in its entirety from the pro-AGW side. It reeks of being a UN lapdog in anticipation of taking advantage of climate change scenarios and scare tactics for a lining of the pockets and future power grab. The study into the “what-ifs” seems pretty sound. This part is fine, which is what I would expect from experts in the reinsurance industry, because this is what they do: they assess exposures, risks, and loss impacts GIVEN A SCENARIO IN WHICH TO ESTIMATE THAT IMPACT. This paper, however, assumes the scenario to be reality. So, what is my analysis on why Allianz would release an otherwise legitimate exposure analysis in the form of a drivel-packed, politically correct, report? M. O. N. E. Y. Suppose that Allianz convinces regulators and customers alike of the need for a “loss provision due to global warming impacts” in their policies. Imagine tax advantages for surplus funds set aside for these events. Now, imagine that every future weather event can be attributed to global warming… wait… I mean, Climate Change, so that a demonstrable drawdown on “global warming reserves” reinforces the idea of human-cause impacts on the weather and storms. The propaganda becomes self-perpetuating, and ever more profitable. At some point, it is likely that all weather risk can be transferred at a guaranteed margin to a global fund to cover all climate-change related events. More conspiratorial, imagine a world of crony capitalism where those who were on the “right side” benefit disproportionately as the UN wields more power and is able to give preferential treatment to its friends with the “right” message. This is simply Allianz seeing the future and hoping to profit from it. And to help it along, what better than to actually promote the entire idea yourself? All-in, so to speak. I’ve got news for everyone who wants to give reinsurers the benefit of the doubt. I’ve been in this business long enough to realize that despite all their fancy modeling and theories, they are the least rational reactionaries to risk there is. Supposedly, this price is based on long-term history until something happens, at which time your rates quadruple. Then, as competitors enter the market, they end up underpricing products. So, whatever sophistication they start with, it goes out the window in a real hurry. But I’m sure this is different. And I’m sure they mean well. I will not be updating the charts in the wake of the latest anomaly released, but thought I’d throw out the quick note that it came in at 0.482, which breaks the stretch of lower anomalies over the last number of months. This is the highest the value has been since late 2010. I’ll put these charts up without much comment. I updated them, so I thought I’d post them. Each one represents the historical slope values for the different trend line lenghts (60, 120, …, 360). I just find it interesting to see how the best-fit trend lines adjust over time and compare where we’re at now to historical values. 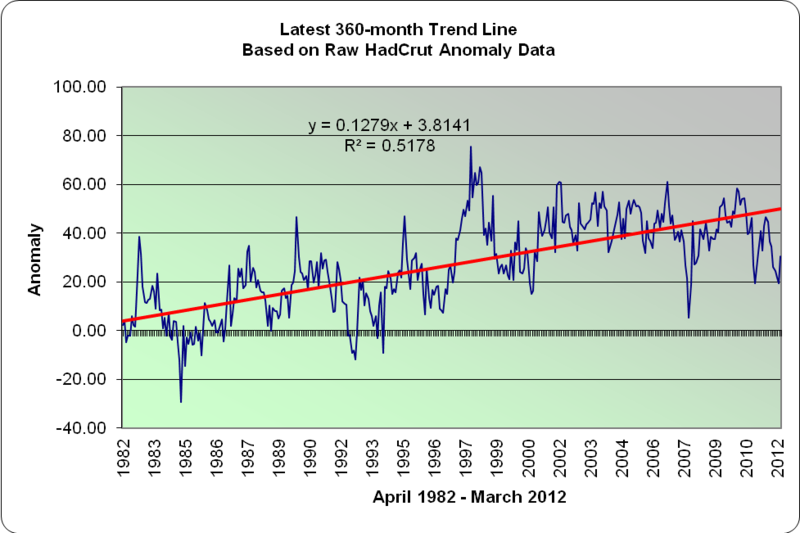 Here are the latest charts for the HadCrut Global Temperature Anomalies, for the 30 year period ending March 2012. What is presented here is the trend over the last 360 months, the slope of which has been in consistent decline over the last eight years. The current slope itself is +.1279. 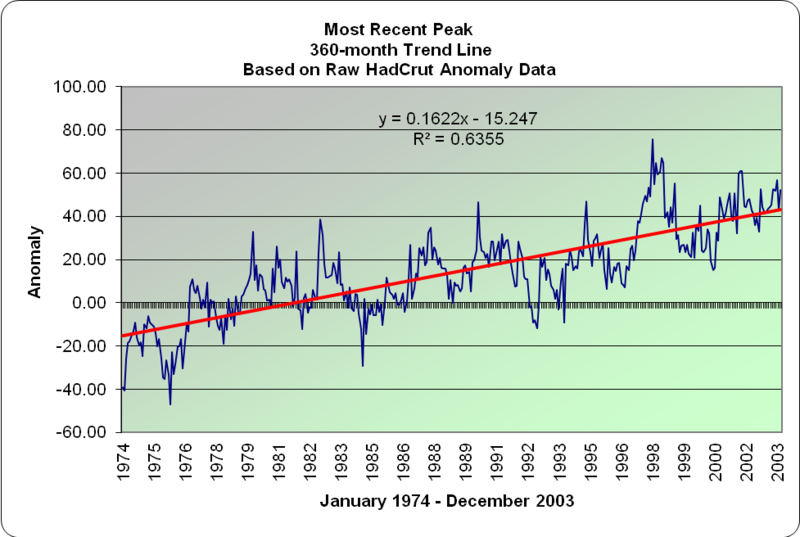 This puts the longer-term trendline of 30 years at a higher slope level than the 20 or 25 year magnitude. If one were to extrapolate this value forward as an expectation of continued warming, it would represent a 1.53 Celsius temperature increase per century. This spurred the question to me as to what starting point in time to current represents the highest current slope. The answer to that is using a starting point of January 1974 (37 years, 3 months), which has a current slope value of 0.13735. 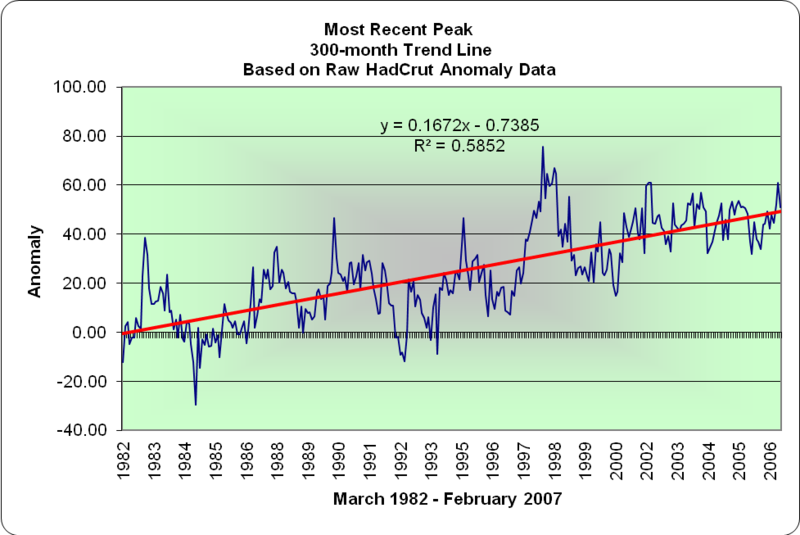 Cherry-picking that data point would indicate warming at a rate of 1.65 degrees Celsius per Century. All trend lines shorter than that (starting at least 4 months ago) or longer than than have a smaller slope value. The next chart is simply a point of comparison. 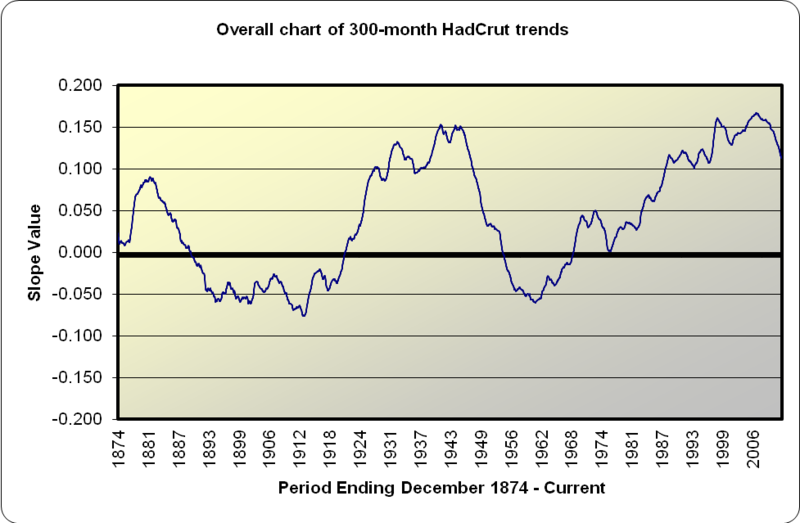 The highest slope value in recent years occurred with the 30-year period ending December 2003, at the height of global warming hysteria. 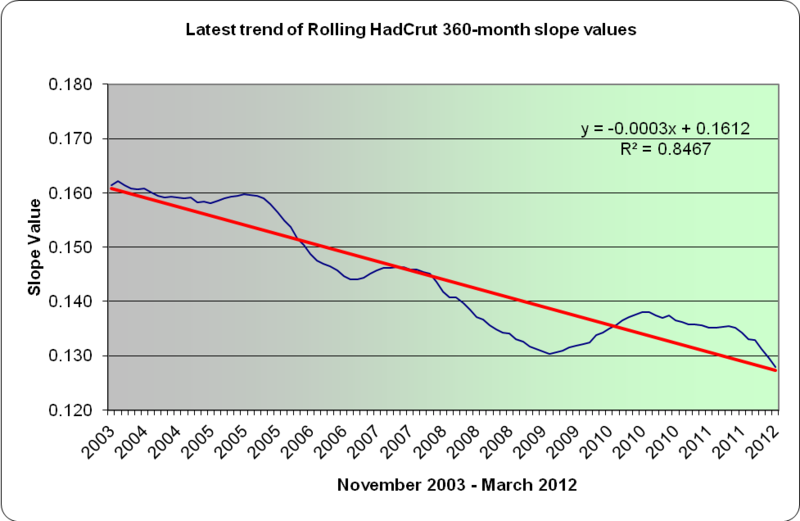 Finally, I show what has transpired with the slopes in recent years with the 30 year trend line. There has been a consistent decline in the slopes since November 2003 of the best-fitted lines. The decline itself is a very close linear fit though not quite as tight as some of the previous charts. There are periods of deceleration and acceleration in the trend, and even some periods where the slope value increases a bit for a time. Similar to the 25-year chart, in the most recent few months you can see it accelerate in its declining value. There is little indication that this decline will halt in the near term. I should explain how I arrive at that statement. I have a spreadsheet set up to emulate future periods, so by simply typing in prospective anomaly values, I can see what the level of the number needs to be in order to put an end to the declining slope values. 1) For the slope to remain level as of April 2012 month end, the next anomaly value has to be 52. 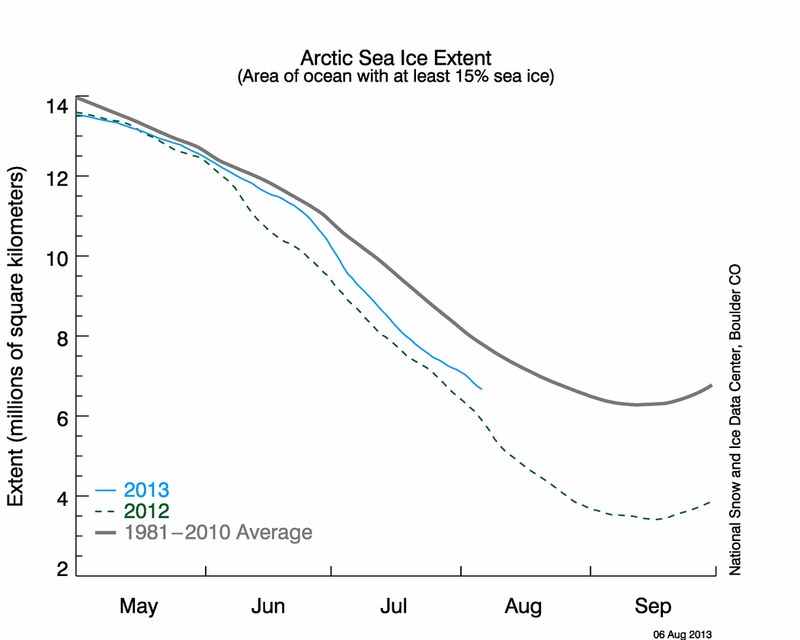 2) For the slope to remain level from April to May, the May anomaly needs to be 51. 3) For the slope to remain level from May to June, the June anomaly needs to be 60. 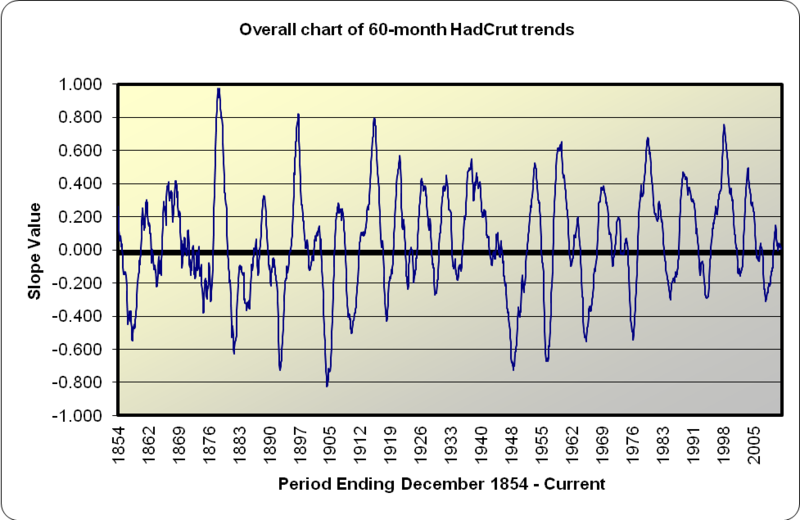 4) For the slope to remain level from June to July, the July anomaly needs to be 57. None of these values are impossible. However, given the fact that last 20 anomaly readings are under 50, it would seem unlikely to expect such a series of values suddenly emerge. 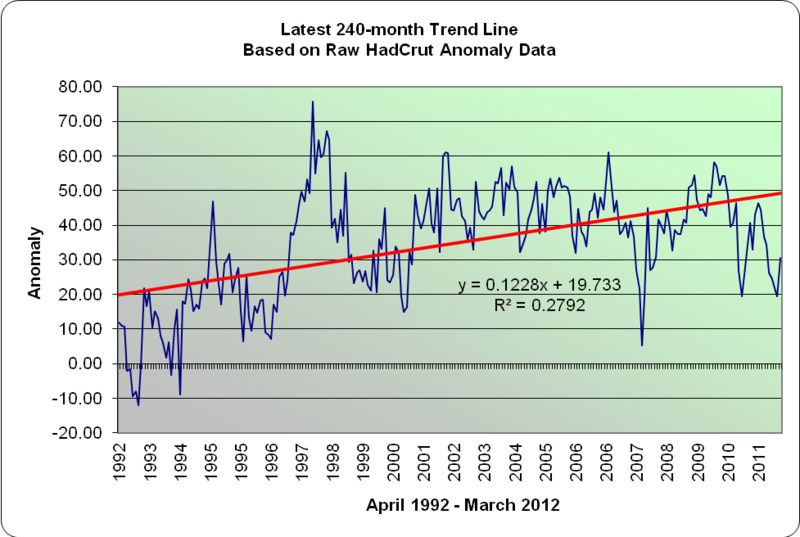 Here are the latest charts for the HadCrut Global Temperature Anomalies, for the 25 year period ending March 2012. The next chart is simply a point of comparison. 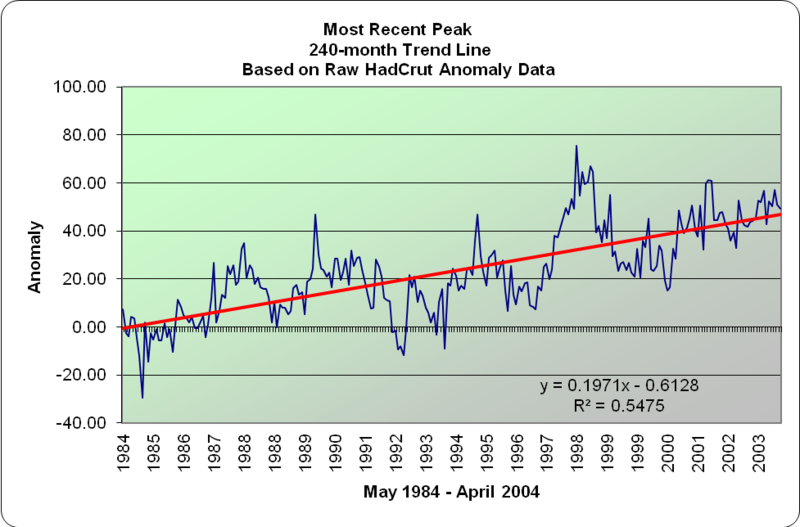 The highest slope value in recent years occurred with the 25-year period ending February 2007. Finally, I show what has transpired with the slopes in recent years with the 25 year trend line. There has been a consistent decline in the slopes of the best-fitted lines. The decline itself is a very close linear fit, though in the most recent periods you can see it accelerate in its declining value. There is little indication that this decline will halt in the near term. 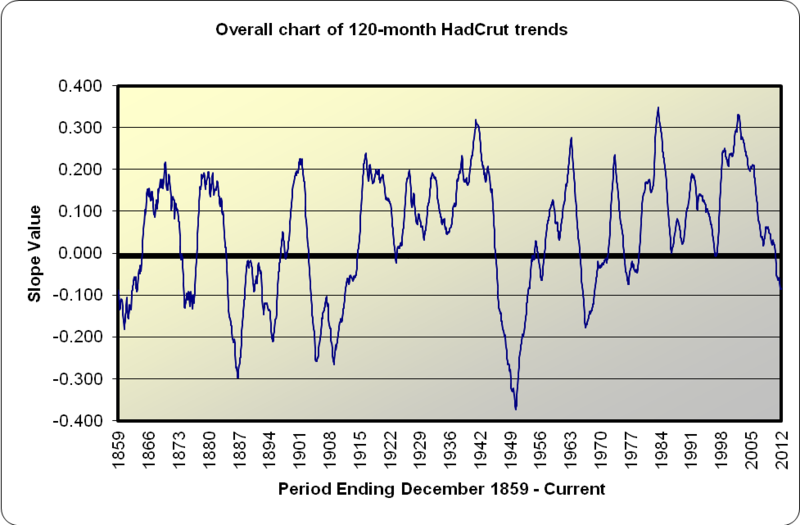 If I plug the latest 12-month average anomalies the values continue to decline. 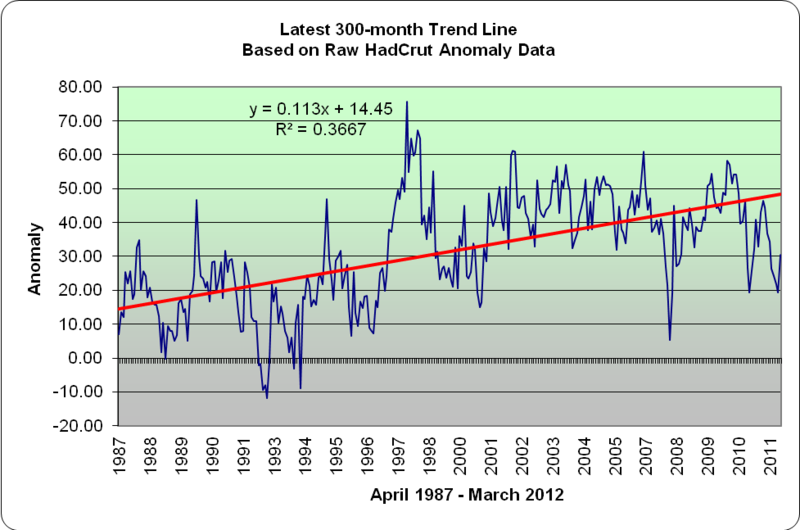 Here are the latest charts for the HadCrut Global Temperature Anomalies, for the 20 year period ending March 2012. What is presented here is the trend over the last 240 months, the slope of which has been in very consistent decline over the last eight years. The current slope itself is +.1228. Sp, at this point, the 20-year trend is still positive, even though the last 15 year trend line is slightly negative. This is due to the first five years of the period (1992-97) exhibiting lower anomalies than current averages. 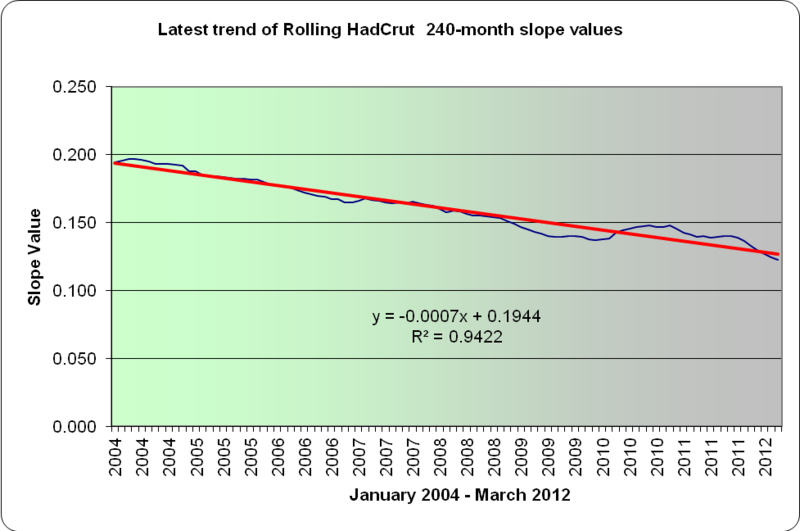 That said, the current slope is the lowest value for a 20 year trend line fitted since the period ending June 1998. The next chart is simply a point of comparison. 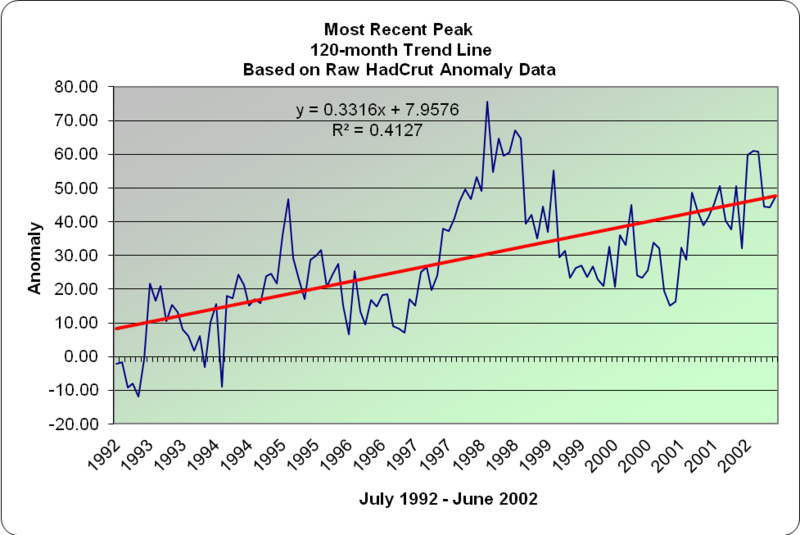 The highest slope value in recent years occurred with the 20-year period ending June 2004. Finally, I show what has transpired with the slopes over the last number of years with the 20 year trend line. 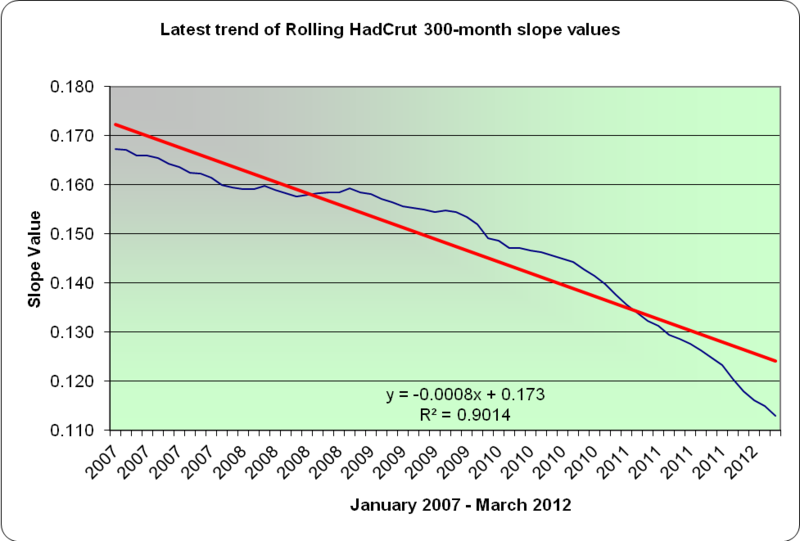 There has been a consistent decline in the slopes of the best-fitted lines. The decline itself is a very close linear fit. There is little indication that this decline will halt in the near term. If I plug the latest 12-month average anomalies into each of the next 6 months, we see this trend line dipping below the 0.10 mark in 6-7 months. 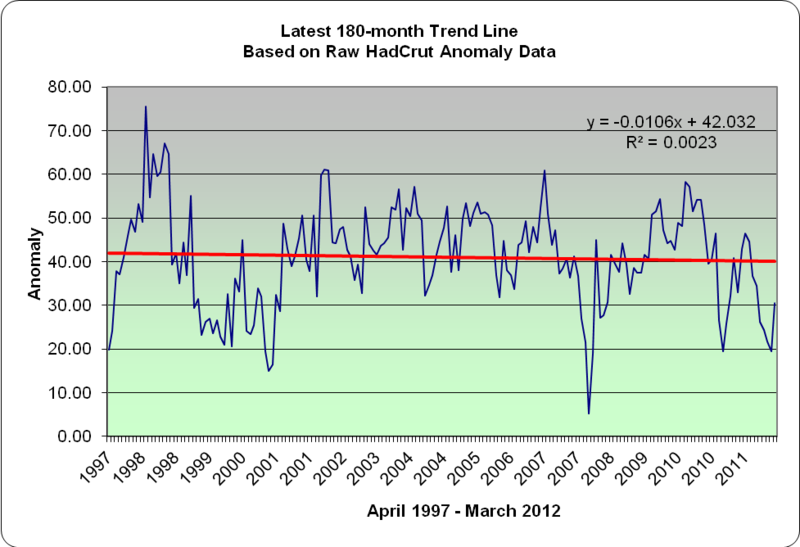 Here are the latest charts for the HadCrut Global Temperature Anomalies, for the 15 year period ending March 2012. 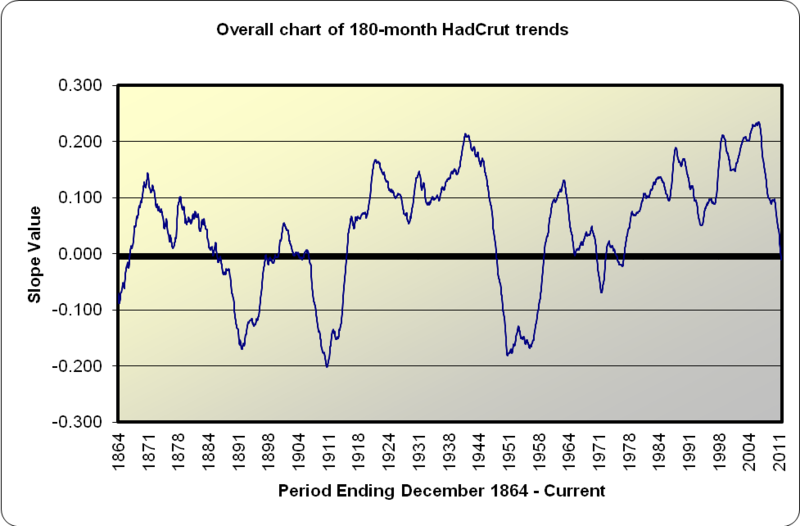 What is presented here is the trend over the last 180 months, the slope of which has been in very consistent decline over the last five years. The current slope itself is -.0106, and it is the second month in which the trend line is negative. The current slope is the lowest value for a 15 year trend line fitted since February 1977 (back when people were concerned about another ice age). The next chart is simply a point of comparison. 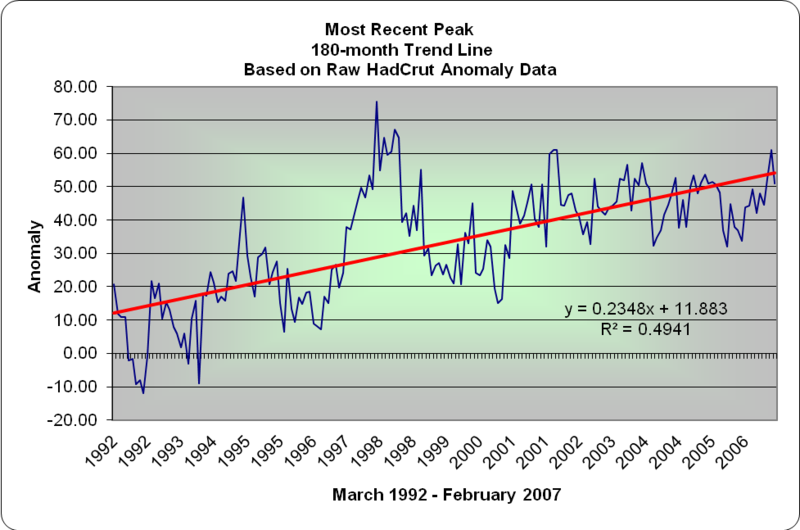 The highest slope value in recent years occurred with the 15-year period ending February 2007. Finally, I show what has transpired with the slopes over the last number of years with the 15 year trend line. 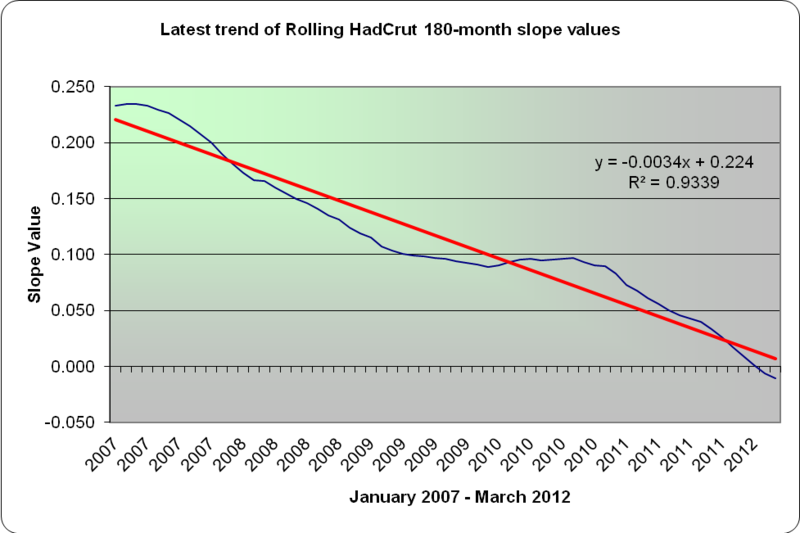 There has been a consistent decline in the slopes of the best-fitted lines. The decline itself is a very close linear fit. There is little indication that this decline will halt in the near term. If I plug the latest 12-month average anomalies into each of the next 6 months, we see this trend line dipping below the -0.03 mark. 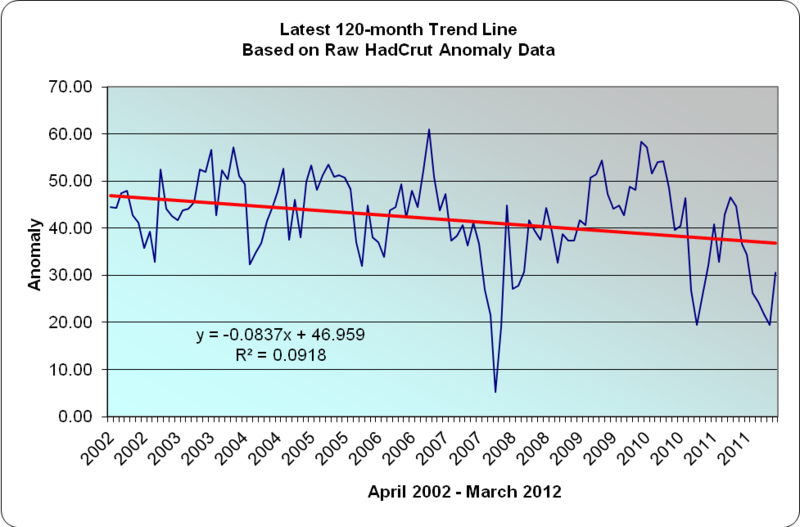 Here are the latest charts for the HadCrut Global Temperature Anomalies, for the 10 year period ending March 2012. What is presented here is the trend over the last 120 months, the slope of which has been in very consistent decline over the last decade. The current slope itself is -.083722, which represents a cooling rate of 0.1 degrees per decade. The negative slope of -0.086789 that occurred as of the ten year period ending February 2012 was the steepest negative trend line fitted since May 1969, if my spreadsheet and eyeballs are working correctly! The next chart is simply a point of comparison. 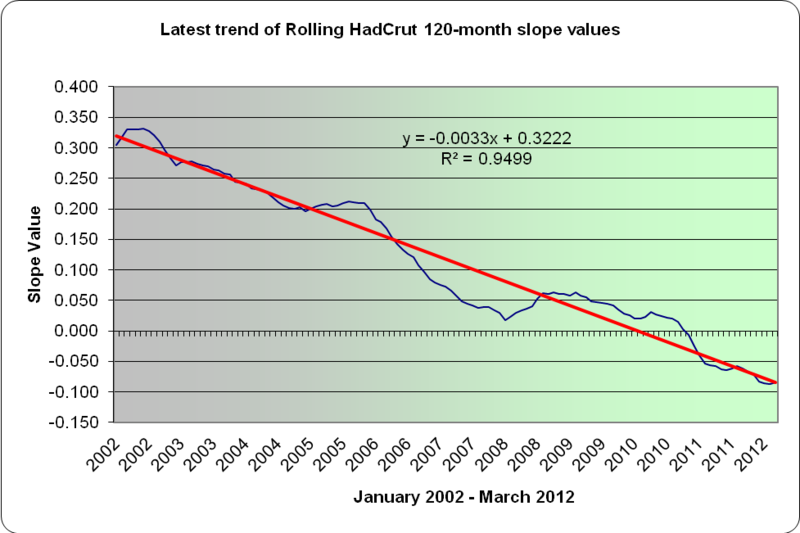 The highest slope value in recent years occurred with the 10-year period ending June 2002. The ten year slope does wobble, but not as much as the five year slope does. Finally, I just wanted to graphically show what has transpired with the slopes over the last number of years with the ten year trend line. There has been a consistent decline in the best-fitted 10-year trend lines. The decline itself is a very close linear fit. There is little indication that this decline will halt in the near term. If I plug the latest 12-month average anomalies into each of the next 6 months, we see this trend line dipping below the -0.1 mark.